During her last active duty posting with the Army at Ft. Jackson, a Desert Storm veteran from South Carolina learned about a local, all-but-forgotten African-American infantry regiment in WWI. 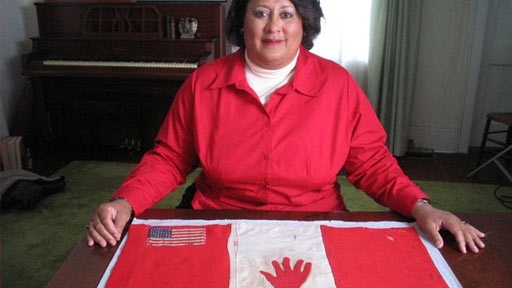 Years later, she purchased a worn red-white-red striped flag with a red felted hand sewn in the center and small U.S. flags sewn in the corner. Our contributor would like to know if her flag was carried into battle by one of the few African-American infantry regiments that fought in WWI under the command of the French. These unsung heroes of the Great War exhibited extraordinary heroism in battle and were highly decorated. If this particular flag has French origins, though, why is it red-white-red-striped and not blue-white-red like the tricolor flag? History Detectives investigates whether this flag can be linked to the legacy of the Red Hand Division and its wartime triumphs. Also in Emerging Modern America: 1890-1930 Bootlegger's Notebook Does this book belong to a Prohibition era bootlegger? Also in Emerging Modern America: 1890-1930 Silent Film Reel Could this film reel could be a silent movie once lost forever to history? Related Investigation Face Jug What does this ceramic face reveal about the Middle Passage and a captive people’s search for identity? Also in Emerging Modern America: 1890-1930 Houdini Poster Could these be original theatre posters of the greatest magician on earth? Also with Elyse Luray Josh White Guitar What role did this guitar play in the transformation of the music industry in the 1960's?